This is not my ideal delivery method for Corned Beef. I much prefer it sliced nice and thin and piled mile high between a pair of deli rye slices. And just a touch of mustard. Oh and some dripping melted swiss. But if we're just talking about Corned Beef transportation, this Detroit import from United Meat & Deli will probably be sufficient. Imagine!! 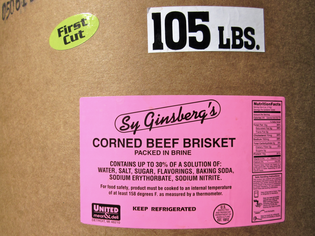 How many sandwiches can you make with nearly 100 pounds of Corned Beef briskett?!! At least three or four. . . . I found this empty keg as a prop at the Greater Cleveland Council's Glacier Ridge District Cub Scout Day Camp this summer. And then for lunch I had to have turkey and cheddar on a pita. Oh, the inhumanity!